We are taking a trip. A rather long one. We are driving from Colorado to see my sister in North Carolina. With a three year-old and a five year-old. The kids and I have taken several long car trips before (none of our family lives closer than a solid one-day drive-about 14 hours- and we have been several times to Washington, which is another two day trek) but they haven't been recently. Also, this will be the first time Joel has had to travel with the kids for more than a day. We have a very tiny car. We do not have a DVD player. We considered investing in one, but we have not had great success with portable ones in the past, so we decided to forgo it this time. We both loaded up our Ipods with movies, but I know that even those get boring quickly. I wanted something that the kids could use to play in their seats, kind of like a table. I debated buying tv trays, but they were kind of pricey. We also have very limited space, so I wanted something compact. I was also thinking it would be fun to have something that was magnetic. Then I thought about cookie sheets. My mom used to give my brother a cookie sheet and magnetic letters when he was little so he could play on the floor. That was it! I bought two cookie sheets (from the wonderful Dollar Tree). They were a little plain, so I decided to spruce them up, with what else? Mod Podge and scrapbook paper, of course! First, trim your paper to fit your cookie sheet. This is really easy, just fold it where it meets the edge and trim along your folded line. Isn't that scrapbook paper cute? I thought I was particularly clever to buy travel themed ones! Next, you will need to trim your edges to fit the rounded corners. Flip your cookie sheet over and trace along the edge, the match up the top and bottom of the paper and you will only have to cut once. Just be sure not to crease your paper! You don't want a big fold line across the middle. You can also use this as a guide because you will have to use a portion of your second sheet to cover the rest of the tray. I just kind of eyeballed how wide I wanted my "stripe" to be, and then rounded the corners on the side that would be against the tray. I also forgot to take photos of that part! Then, spread your rubber cement across the back of the larger sheet. Press it firmly into the bottom of the pan. I used rubber cement instead of Mod Podge because I thought it would hold better on the metal. Then glue your shorter section to cover the remainder of the bottom of the tray. Cover the entire surface with Mod Podge. Remember, use it sparingly! It will bubble some, but I have found that it almost always dries flat. Allow to dry completely- for me, about 30 minutes. Then, cover it with the clear coat. You could probably skip this step, but I wanted it to be fairly sturdy. I used about 3 coats, it only takes about 10 minutes to dry. Ta-da- a magnetic lap tray, suitable for magnets of all sorts, coloring, constructing, eating, whatever. Easy! Then I realized something. Crayons would still roll around and off the tray- although the lip would prevent that somewhat. So I decided to magnetize some crayons. I chose the twistable kind because they don't melt as easily, and they don't have to be sharpened. Also, it prevents my kids from peeling the paper off- one of their favorite activities! I just bought a roll of magnetic strips to use. Cut the magnet to size. I wanted mine to be fairly long so it would hold well. This stuff isn't very strong. I cut my strips in half so they would fit the crayons better. The stuff says it is adhesive, it isn't. It doesn't hold for more than about 6 seconds. So I just ran a line of hot glue down the magnet. Hold it on the crayon until it sets. And you have a magnetic crayon! 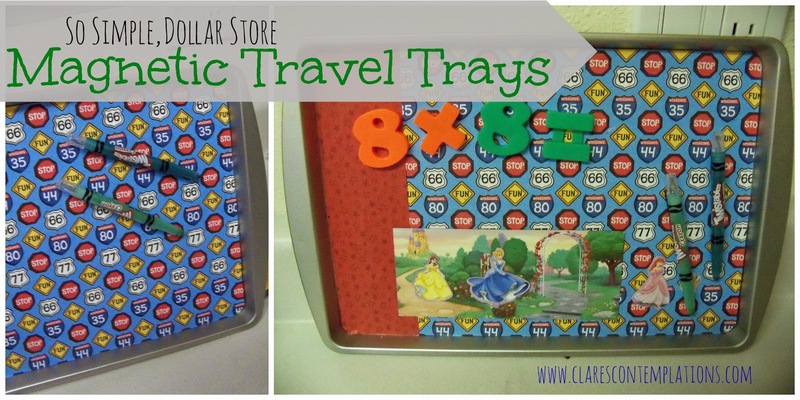 Perfect for your little magnetic tray. Fun, huh? Also, the nice part about cutting the magnet strips in half is that it allows you to put the crayons back in the packaging. Not that they will ever be in there. There you have it- two magnetic travel trays. I hope the kids enjoy them on our trip. Not too bad considering they only cost me about $1.50 each! LOVE! I am having such a blast with all of our craftiness. Your mom and I made the cutest aprons today and we had some hysterical laughs while sewing them. I bought some more scrapbook paper this weekend at a yard sale - $.50 cents for a ton of it. SCORE! I love using it to mod podge clothes pins (didn't post a picture - maybe in the future) for chip clips, re-create old magnets and cover anything else I think needs a make-over. Thanks for the inspiration! Have a fun trip. Stay safe! Love you all! Very cute...you are so good at finding uses for your Modge Podge & scrapbook paper. Just wait til you see my newest (permanent) bulletin board for my class' writing assignments. It's gonna be a cutie! !